In our new issue, we look ahead to WMOF2018 as Brenda Drumm writes on what we can expect at the international celebration in Dublin next year. We also hear from Father Paul Byrne, PP of Derriaghy Parish in Down and Connor, who writes on the importance of reconciliation in the family. 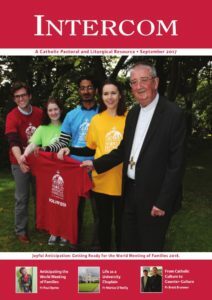 Also in this month’s issue, we prepare for the return to school with resources for a Blessing of Schoolbags, Father Gerry McFlynn writes on the 60th anniversary of the Irish Chaplaincy in Britain, Father Brett Brannen reflects on Vocations and Maria Hall offers insights on the Ministry of Alter Servers. All this and more along with our usual prayers, reflections and resources for the month of September. Newsletter, Irish Mass and Family Mass Resources for September are available here.